We have a lot of African safari trips within our programme and although the light there at dawn and dusk can be exquisite the speed at which the sun rises and falls there is very quick indeed and so that doesn’t last for long. The end result is that a good percentage of any day’s photography is spent in brighter conditions, and often very bleached looking skies. It’s conditions that occur often on long hot spells such as the one we’re having here at home right now too. Rather than simply packing up the kit altogether at this point I think of this as monochrome time as when the whiteness of a sky is rendered as exactly that then anything set in it offers great contrast and therefore the basis of an image. 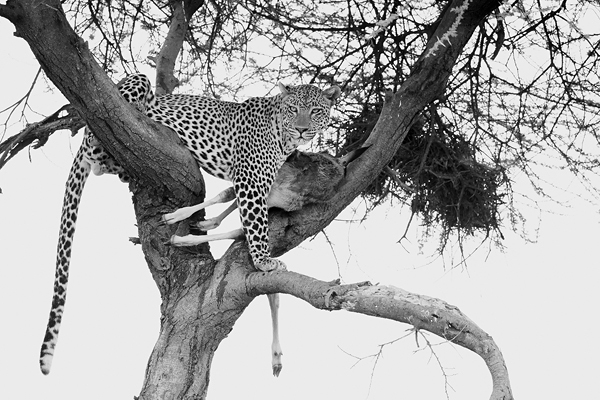 This leopard in a tree image is a perfect example. 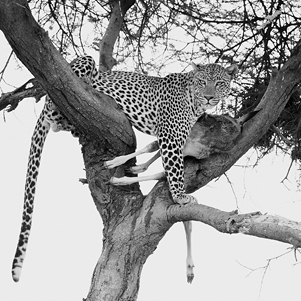 It was photographed mid-afternoon and because it was in a tree with its kill there was no option but to have the sky as a background with all the lighting and exposure challenges that brings. I chose to make sure that the sky was completely blown out (thereby ensuring a good exposure of the leopard and tree) and effectively made a high key exposure, and by flipping to monochrome when processing the RAW file was able to easily work on making the image all about the texture and contrast of the leopard and thereby get a very worthwhile image at an otherwise tricky photographic time of day and set of conditions. Something to think about as this current hot spell looks to continue here, or when you’re in Africa yourselves.